I want to try Left 4 Dead, but there’s still so much Fallout 3 to do. Here’s some recent highlights. Dave, in his New Republic of Dave. Dave stormed out of his previous realm when I manipulated the ballot box during what he expected would be a triumphant re-election as president of the Republic of Dave. 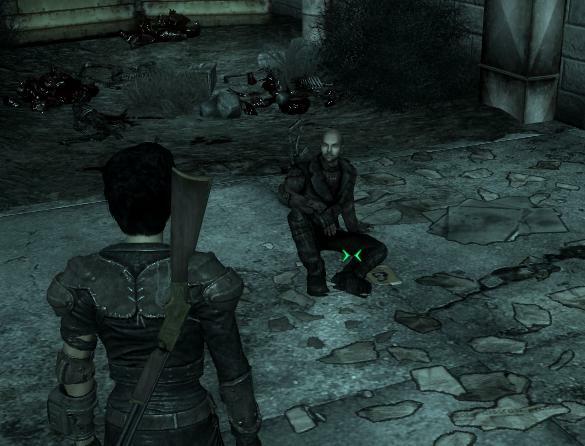 If this wasn’t pathetic enough, next time I checked on him, he’d gotten eaten by Deathclaws. Sometimes I make some poor fashion choices. I still like the Vault 101 jumpsuit, but I hate having to pay to repair it. Raiderwear is interesting and easy to come by. But now I’m wearing the Laather Armor since its protection level is much better. 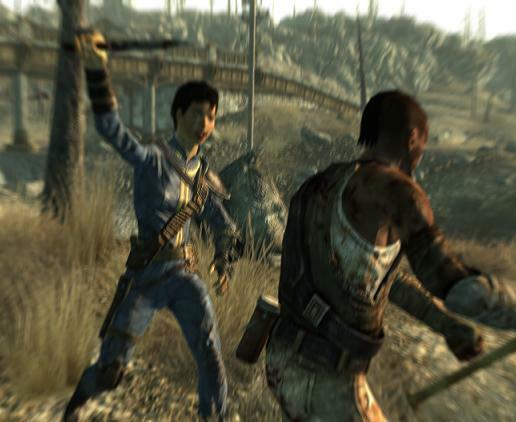 Combat as seen within VATS. Nice action shot, but I wield a knife like a girl, don’t I? An upward thrust is more effective, or so I’m told… I don’t get to attack many Raiders in real life. Amusing show at the Museum of History. 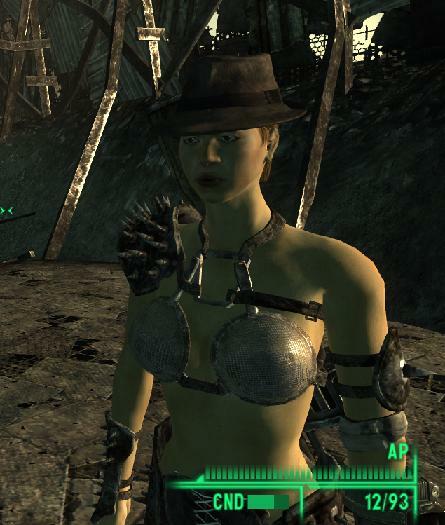 As in Oblivion, there are a lot of interesting little things to run into– Uncle Leo, for instance, the only friendly Super Mutant; or an artfully arranged crashed train; or the lesbian Ghouls; or Tinker Joe, who even in death (NPCs should really be more careful about the wildlife) is faithfully attended by his robots. I think my one complaint is that some quests require huge skill scores to fully experience. I had to throw a couple of levels’ worth of upgrade points into Speech, and now I’m building up my lockpick and science skills, putting some things on hold till I’m ready. On the other hand, just about everything turns out to be useful in some way, eventually. I took a toy car home as decoration; it turns out I can use it to build a dart gun. And after a long time, I finally got some great weapons that use the .44 bullets I’d been accumulating.